The most common colours of the Scottish thistle are reflected below in my version of the Thistle Bloom quilt block. This version of Scotland's national flower is technically an eight patch block, but I have designed it to be sewn in an easier fashion (at least in my opinion) -- as an uneven nine patch. You will get lots of practice making flying geese as well as half square triangle patches. 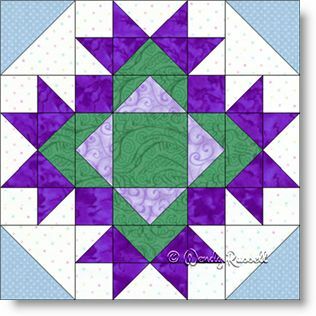 The only difficulty in this construction of this quilt block is to make sure to always maintain an accurate quarter inch seam allowance due to the number of seams in the block. The sample quilts illustrated give you ideas of using both an on point setting or the more commonly used side by side setting of the blocks.